Rice is one of those foods that you'll drop into your shopping trolley without actually planning any meals around it. It helps to fill up the cupboard it's a staple, it's cheap but it's often neglected and left to languish with the remains of pasta shapes that don't match newer packets but aren't quite sufficient to make a meal on their own. Rice is very easy to cook but it's also very easy to get wrong. It's nutritious, filling and versatile and yet it doesn't always get used to its full advantage. Plain, boiled rice might be served up as an accompaniment to a jar of curry as a stand-by meal and, although there's nothing wrong with that, it can be so much more exciting! This is the one that's probably in your cupboard at home. 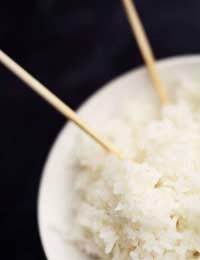 Although there are many different types of long grain rice, the most common is suitable for use in all kinds of dishes so it's very versatile. This is the traditional accompaniment to Indian food. It has a thinner, more delicate grain and is generally considered to be the highest quality rice. As it has a delicate grain, it cooks quite quickly, which is why people so often end up with a glutinous pile of stodge. You should rinse if thoroughly and really keep a close eye on it while cooking, testing it every couple of minutes. When cooked, drain and rinse through again with boiling water. The healthy option but also a tasty one. The grains aren't milled (as they are with white rice) so it's more of a complete grain and there's more goodness. Brown rice is a slow-release carbohydrate so good for all you GI (glycaemic index) enthusiasts. It takes about 30 minutes to cook so it's not a good choice for a really speedy meal. You'll see two main varieties of risotto rice in the supermarket: carneroli and Arborio. These have a short, thick grain that is capable of absorbing up to three times its weight in liquid, making it ideal for risotto dishes. The key to a good risotto is patience - you need to stand by the pan and stir constantly, gradually adding the liquid. Follow these steps and your rice should be wonderfully fluffy, with nice separate grains, every time you cook it. Measure the amount of rice into a large pan, cover with cold water and swirl the rice around with your fingers. Drain and repeat until the water runs off clear. Transfer the rice into a colander then fill the pan with water and bring to the boil. Meanwhile, bring a kettle of water to the boil. Simmer the rice according to packet instructions and begin testing the rice a few minutes before the recommended cooking time. Keep doing this until you're happy the rice is cooked. Drain thoroughly in a colander and, if you like, you can pour the water from the kettle over the rice for one final rinse. If you're not ready to serve the rice, return it to the pan and cover. Rice is a staple student food but it's also a great source of carbohydrates. Try out some different varieties and experiment with new recipes to get really get the most out of it.